CHARLOTTE—The best way to think of Obama’s convention speech is as the conclusion of a four-part argument that began on Tuesday. Michelle Obama made the case for her husband as a character—as a man of virtue and somebody who understands, intuitively, how the average American feels. Bill Clinton focused on substance: What Obama had accomplished in the last four years, and what his opponents were threatening to accomplish in the next. Joe Biden’s purpose, as I noted earlier, was to vouch for Obama as a leader—to show how two key episodes in Obama’s presidency, rescuing the auto industry and dispatching Bin Laden, revealed the president’s inner mettle. That left just one task for Obama himself: To talk about the future. It’s more or less what he had to do in each of his last two conventions speeches—the keynote address in 2004 and the acceptance speech in 2008. I'm sure I'm not the only one who found it a lot less inspiring than either one of those. But inspiration on Thursday night would have been difficult. In 2004, Obama could indulge in lofty rhetoric because he wasn’t running for president. In 2008, he had to sketch out an agenda, but he could do so as somebody who’d never had to implement one. If Obama had tried that this time, he ran the very real risk that people would dismiss it as making promises he could not possibly keep. 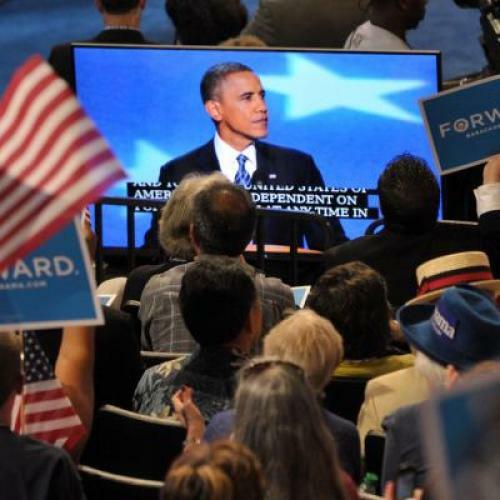 Instead, Obama defended his record and reminded voters of what he still hoped to accomplish. And he did so obliquely. A million new jobs, a doubling of exports, recruiting 100,000 math and science teachers, reducing the deficit by more than $4 trillion over the next decade—these were references to existing proposals for taxes, energy, education, and fiscal balance. He didn’t refer to any of these proposals by name and, as far as I can tell, he didn’t talk about the elements of his jobs plan. He made reference to the most important accomplishment of his first term, health care reform, only by implication. It was only here, near the end of the speech, that Obama started talking in loftier terms. And, superficially, he was making the same argument he made in 2004 and 2008—about the importance of bringing Americans together, even as his political adversaries were trying to push Americans apart. But in 2004 and 2008, Obama was effectively making a case for bipartisanship—for overcoming the acrimony between Democrats and Republicans. This time, Obama was effectively making a case for social solidarity—the idea that everybody can benefit from programs that provide education or health insurance, and that everybody has an obligation to support them. And he was reminding voters that one party, the Republicans, don’t believe those things. Of course, even the rhetoric in this part of the speech lacked the magical quality of his past efforts. But maybe that’s OK. The focus of Obama's second term isn't going to be accomplishing great new things. It will be finishing the work of the first term, and protecting Americans from the Republican agenda. That's not inspiring. But it's awfully important.